When you start a business, you enter one of the most competitive, cutthroat arenas in the world. Where one business does not succeed or becomes complacent, hundreds of competitors swarm the waters waiting to take advantage of any misstep. Even as a business triumphs and succeeds, competitors follow your roadmap and try and emulate your success. The landscape is constantly evolving, and business that stand still, do not innovate, or are content with mediocrity eventually flounder. Just look at Kodak, Research in Motion, and Blockbuster, to name a few. Over the last 10 years, we’ve been through a number of evolutions in our industry and faced increasing competition in all facets of our business. Despite that, we continue to grow and stay a leader in our industry. The key? Evolving with the competition. When I started BizChair.com, we had no inventory on hand. This was possible due to the evolving supply chain and the Internet: no longer did customers have to visit a showroom to view products. And no longer did retailers have to stock merchandise for their customers to buy. When a customer would purchase an item from a retailer on the internet, the retailer would then order that item from a distributor or manufacturer and have it shipped directly to the customer. This process is seamless to the customer and happens a fair amount; it is called drop-shipping. Many large retailers, including Wal-Mart, routinely drop-ship products to augment their online selection (without increasing overhead or inventory costs). As a startup, not carrying inventory was critical to our company’s success. If we had stocked inventory to start, we would have had to also invest in a warehouse, employees, infrastructure (forklifts, pallet jacks, wrappers, etc. ), and space in addition to buying the inventory. Given that I only had about $3,500 that I had saved up over the years from some other small business ventures, that was out of the question. But since the Internet was still new, and not many others were selling furniture online, the drop-ship business model worked. And our startup costs – and risks – were minimal. Only when we started advertising BizChair.com did we see how popular furniture was on the Internet. Furniture has always been a traditionally high-margin item due to the overhead and inventory requirements. Being able to undercut all of the traditional brick-and-mortar retailers and offer a far more extensive selection (because of drop-shipping) gave us a significant competitive advantage. The counterpoint was that customers would have to rely on photos and text to make a buying decision. The verdict was (and still is) that most consumers would rather save money and buy online while taking a small risk for most products (which has diminished with the introduction of videos and 360 images). Given the success of Internet-based retailers, competitors naturally joined. It was only a matter of time before word spread among the close-knit furniture industry that a few smaller retailers were growing very quickly selling office furniture online. The Internet was also gaining traction, with sales growing upwards of 50 percent in 2003. In what was seen as a modern-day gold rush, competitors both new and old launched e-commerce websites, vying for a share of this rapidly growing industry. While the low startup costs helped me launch the business, it also meant that it was just as easy for competitors to launch. It was only a matter of time before the Internet would become crowded with thousands of stores selling similar products. Drop-shipping also enabled other competitors to open up and undercut pricing. So why would a customer purchase from us when a competitor was selling it for $10 less? Differentiation based on customer service and consumer-friendly policies (free shipping, for example) became increasingly important. Otherwise, it was just a matter of time before we would become a marginalized player, with shrinking profits and margins. So, How Do I Differentiate Myself? While it would be nice to think that consumers think about more than pricing when selecting a website to purchase from, that is one of the dominant drivers in the decision. Just look at Amazon – their pricing is almost always the best, and they offer excellent service and fast shipping. What more could you want? When we launched in 2001, we offered free shipping and a 60-day money-back guarantee to entice customers to try ordering a chair online. These were both revolutionary offers at the time, and helped us grow sales at a rapid clip – up to 100 percent per year at our peak growth rates. A recurring theme that we heard was that if we bought larger quantities and stocked them, we would be able to realize greater discounts (upwards of 10-15 percent off). The downside? Cost. So we took a gamble and started working with a third-party warehouse provider. We shipped a trailer of our most popular item as a test to determine how well it would work. Again, the risk was relatively small, and there was minimal upfront cost. We also had sales history and the items that we sent were also our most popular – we sold about 750 of them per month and only had to buy 550 for the initial order. Those chairs quickly sold and we determined that, in order to maintain our market position, we would move toward stocking more product. While others were racing to the bottom to compete for sales, we would have that extra margin since we owned the inventory. It is somewhat ironic that the one thing that allowed me to start the business (drop-shipping) was replaced by such a capital-intensive business model in order to keep the company growing and profitable – but that’s what “evolving” is all about. It’s almost amazing to look back and see how fast the industry and Internet have changed. When we first started, all of our sales were drop-shipped. Just five years ago, the vast majority of our sales were from drop-ship vendors. Today, drop-ship sales make up just a fraction of our business and merely augment our selection to provide more options to our customers. We now stock over 1,000,000 pieces of inventory and have over 700,000 square feet of facility for distribution. 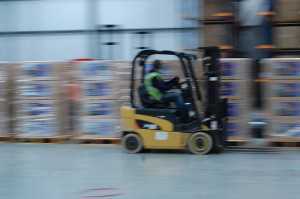 The warehouse buzzes with forklifts and pallet jacks around the clock. Inventory ownership has been one of the driving forces behind our business and has helped grow us through the recent recession. We’re also able to provide higher customer satisfaction levels by controlling all facets of the shipment process and decreasing delivery times. To be honest, if we were unable to drop-ship, I don’t think BizChair.com would have started. Coming up with an idea and executing are one thing, but investing tens of thousands (if not more) into an unproven idea can be daunting, even if you believe in it with all your heart. I doubt a bank would have lent a 14-year-old $100,000, and I had no practical way of raising the money at the time. Not to mention only about half of businesses last more than five years. Starting any business venture involves risk – and that is why the rewards for success are so plentiful. The key takeaway is that risks should be prudent and success will follow. Overextending yourself is setting up for failure. I’ve been through a lot over the past 10 years: I’ve seen competitors come and go, revolutionary products introduced, and technological innovation that has disrupted industries. Staying ahead of the curve and always evaluating how your competitors and industry is changing is imperative. Taking risks and trying new ideas is what entrepreneurship is all about; don’t be afraid to uproot a market and buck the trend. But don’t close your eyes once you’re at the top and let the rest of the competition catch up, either. Sean Belnick is the CEO of BizChair.com. This post originally appeared on his blog.